I have to say that I'm surprised nobody answered the question posed in my previous post, but then maybe nobody actually knew the answer. It doesn't matter now, though. I asked Penny last night at the NWG meeting. The answer? She thought it would be fine to send in a second manuscript before the first one had been dealt with and after the group threw the question around a bit, everybody thought that it would only serve to prove that I'm not a one-book wonder and that I can write at the kind of speed required of HMB (they like their authors to deliver four a year). So that's ok then. I don't have to worry about writing too many, although I think my next one will be aimed at the ModX line; the idea I have seems to feel more at home there. But that's a long way off yet and things could change. Right now I'm going to concentrate on Darcie and Alex, and just keep enjoying their story. The meeting was good last night. Nine of us were at Penny's new house and although a thunder storm banished us from the garden and into the living room, we all survived the heat. I always leave the group feeling motivated and raring to get back to my laptop and let the words flow. I said I'd get 1500 words down after the meeting, but I didn't. I stopped at 950. There comes a point where you just have to go to sleep, like it or not! It still felt good, though, and I even had a few ideas that I want to use in Alex & Darcie's story, one of which was spurred by Richard telling the group about our leaking roof and the other by a hairy moment I had during the drive back home. It's hot here again and sitting in this bedroom with the laptop on my lap (why call them laptops when they're really not practical for use balanced on the lap?) is not where I'd most like to be. I might well knock off early today to sit outside for a bit, and then work this evening instead. That's the luxury of being a writer - you can pretty much choose your own work hours. Well... that's actually the reason why I have to work from home. When I'm feeling poorly, I can rest and then I can catch up later when I'm feeling perky again. We didn't get to Tilstone Lock the other evening. They have a "No Parking" sign there now so unless you happen to live right on top of the place (which means in one of the half a dozen houses within walking distance), you can't use it for picnics. Shame, because it's so pretty there. Never mind, though. We went one lock further down to Beeston, instead (both are on the Shropshire Union Canal). Poppy got to run around, met another dog and appeared to wonder what on earth it was (she honestly seems to believe she's a human even though she's been properly socialised with other dogs). She was all tail between her legs and "rescue me - there's a hairy thing looking at me". Still, finding something smelly in the grass to roll in made her day (maybe not so human after all?). I might drag Richard along to The Limelight for a quick drink this evening. I have to go down there to buy tickets for a "D-ran D-ran" gig this Saturday that a couple of friends and I are going to, so we might as well make the most of it with a bevvy on the terrace. Have you ever heard of the 'Snowflake Method'? No, it's not a new fangled form of contraception, it's a plan for writing a novel. Written by Randy Ingermanson, it takes you through 10 steps of designing a novel from writing a one-sentence summary of your story to designing your characters and listing the necessary scenes that have to be part of the finished novel to the final step which is actually getting on a writing the darned thing. I have to admit that I don't follow the Snowflake Method but I do use parts of it and found reading it was useful. PS: If you're around, Iona. That blue boat on the far side of the canal in the photo - it's name's IONA. In my dreams I'd have a sleek, expensive, glamorous kind of a boat named after me. The kind that languishes in very blue water off the Cote d'Azur. 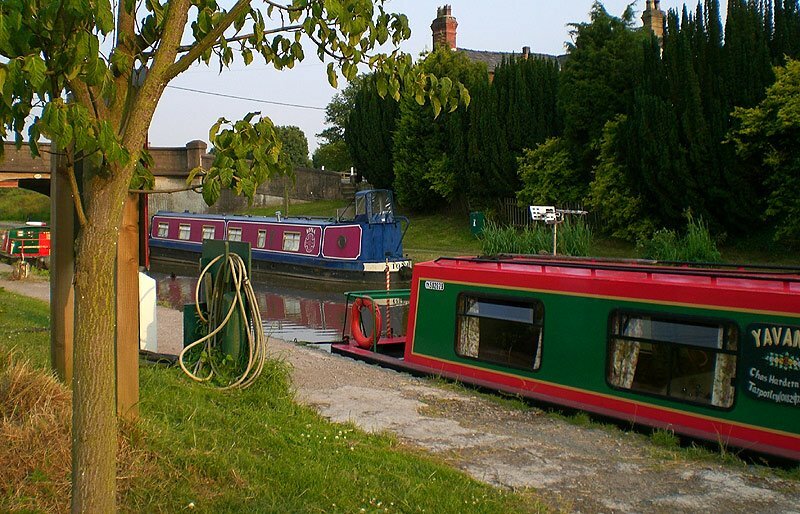 In reality my namesake vessel is a flat-bottomed barge on the Shropshire Union Canal. Life is so disappointing sometimes. Hi Sharon! Thanks for sharing what you learned about HMB submittals! I know what you mean about leaving meetings feeling motivated and ready to write. I always feel that way after my RWA chapter meetings. We have a day long meeting on Saturday that I'm really looking forward to! Julie. Take a look at the comment in my previous post. Kate Walker has written something there that's helpful. A day long meeting sounds excellent!